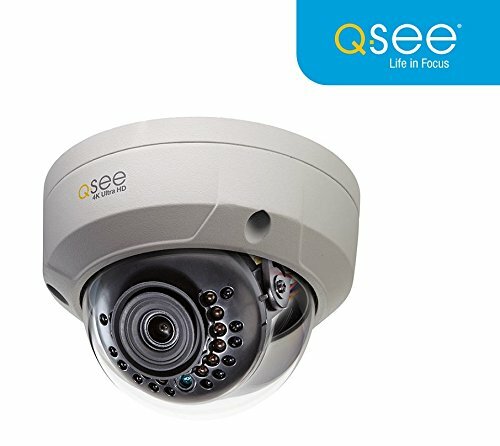 Watch over your home or business property with the expanded surveillance offered by the new Q-See 4K IP HD Bullet camera. Experience video footage that delivers four times the resolution of 1080P so that you see every detail of every event or activity– from facial recognition to license plate number identification, your 4K IP HD Bullet camera provides crystal-clear image sharpness that leaves nothing to question at those crucial moments! powered easily by PoE (power over Ethernet) cables, your 4K Bullet camera captures every moment by connecting directly to an existing NVR, or to an NVR via network, offering more extensive and flexible surveillance. Power over Ethernet (PoE) capability: Q-See IP HD technology features power over Ethernet (PoE) access for your IP products. H.265 video encoding & camera Support: what exactly is H.265? H.265 is a video compression technology that allows for optimized mobile streaming. Enhanced High-power LEDs: enhanced High-power LEDs greatly boost lighting capacities for long-range visibility, delivering sharper image clarity.